Enjoy a magnificent expedition cruise that will take you to visit the fascinating and wonderful beauty of South America. You will get to know one of the most beautiful places in the world, which is the southernmost and wildest region of the world. Sail comfortably through the Strait of Magellan and the Beagle Channel, along glaciers, bays and fjords, discovered and explored in the 16th century. This is a more "hands on" experience than you get with the larger cruise ships because you get to places that they can't get to and you make more shore excursions - so you get to see more up close. category in Travel + Leisure’s World's Best Awards 2018. ​Offering an alternative of 3 or 4 night cruises or a combined 7 night cruise from September to April each year, the Stella Australis sails from the Chilean port-city of Punta Arenas, and from the Argentinean port of Ushuaia in Terra del Fuego. The brand new Ventus Australis will start sailing on 4 and 8 night cruises in January 2018. The tour begins by sailing across the legendary Strait of Magellan and continues along channels, bays, and fjords, passing glaciers, snowcapped peaks, islands and unexplored forests of incomparable beauty. The imposing Serrano, d´Agostini, Garibaldi, Brookes and other glaciers will oversee our journey, and their majesty will remain engraved in your memory for ever. You will enjoy daily excursions to a land where our guides will teach you about the wildlife of the area, as well as the history of its early inhabitants. Puerto Williams, the farthest southern town of the world, will be our closest contact with the native peoples of this remote region. Definitely, this will be one of your most pleasant and unforgettable experiences, because Patagonia - explored from an Australis ship, leaves no one unimpressed. 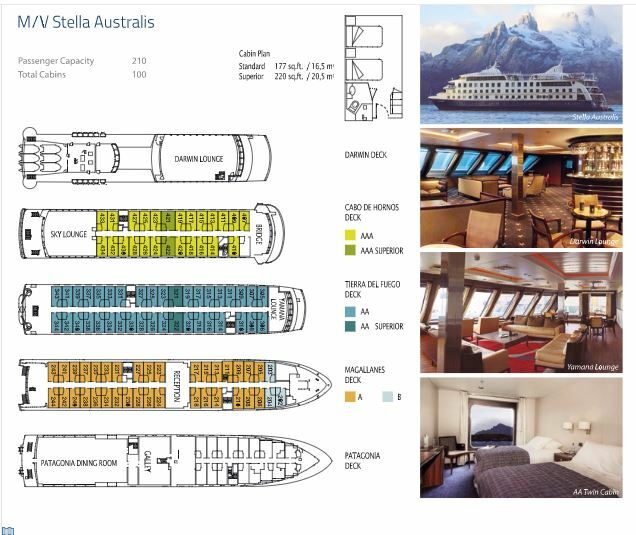 The Stella Australis is a awe-inspiring cruise ship. The ship, which was constructed in 2010, consists of 100 total cabins and can hold up to 210 passengers. You won’t even miss working out on your Patagonia vacation as the ship contains a gym for passengers. Each cabin is 177 square feet. There are 3 B cabins, 34 A cabins, 36 AA cabins, 23 AAA cabins, 2 AA superior cabins and 2 AAA superior cabins. The expedition team and the entire crew will be in charge of making sure your trip is pleasant, fun, and interesting. They will organize activities on board in a friendly and warm atmosphere. 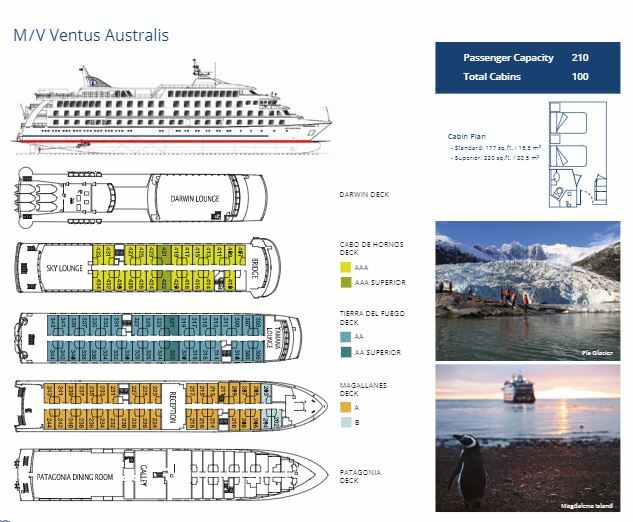 The Ventus Australis is the name announced for the new state-of-the-art ship. Tailor-made for exploring the remote southern tip of South America, all aspects of the 210-passenger ship -- including size, length, draft and engine power -- are designed to give Ventus Australis the extreme maneuverability necessary to navigate narrow fjords and channels where no other cruise ships can venture. Ventus Australis will feature the latest regulations regarding safety at sea and protecting the marine environment, as all of the fleet does. You will be able to participate in daily excursions on zodiac boats with expert guides. They will give audiovisual talks about the flora and fauna, geography, glaciology, ethnography, and history of the Patagonia region. The official languages on board are Spanish and English, but there are also guided trips in French and German for a minimum of 15 passengers per language if you require it. You can ask about other languages. For your convenience, they have satellite telephones (with prepayment) and an onboard store with sporting clothes, souvenirs, gifts, and personal use items, among other things. They have an all-inclusive meal system at defined times. Lunch is a buffet with a choice of food allowing you to try the delicious flavors of Patagonia. Dinner is a defined menu with several choices. There is an open Bar at defined hours with soft drinks, alcoholic beverages, and selected wines. CONDITIONS • Subject to space availability. • Promotional rate is for one child under 17 years old, sharing cabin with an adult. ▪ Does not include boarding fees or tips. ▪ Promotion valid for departures during December 2019, subject to availability. Does not include the departure of December 30th. ▪Promotion not combinable with other promotions or benefits. ▪ Promotion valid for reservations made between April 1st, 2019 and May 31st, 2019. ▪ The reservation deposit is due within 10 days of the reservation date. Infants between 0 and 3 years old have a 100% discount, sharing the bed with their parents. Children between 4 and 12 years old have a 50% discount, sharing a cabin with an adult. Rates include accommodation, sea transportation, all meals, open bar when on duty (without additional cost for wines, beverages, and liquors), shore excursions, and onboard entertainment. Optional tours and transportation are not included in the cruise rate. These costs may be modified by the port authorities of each country. The following penalties will apply in case of cancellation as soon as the Company receives written notice. From 119 and 60 days before departure US$300.- (Deposit). From 59 and 50 days before departure 25% of sales value. From 49 and 40 days before departure 50% of sales value. From 39 and 30 days before departure 75% of sales value. From 29 and 0 days before departure 100% of sales value. Trekking or hiking shoes are required for all passengers.